The hit of any party. 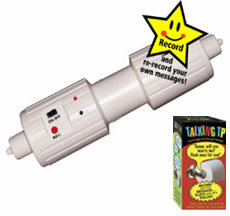 Talking TP, the recordable and rerecordable toilet paper spindle with a motion sensor that is activated when you pull the toilet paper. Just press a button and record and personalize for the next person using the throne. It also has an on/off switch so it can be used as a standard TP spindle when desired.